Instead of recognizing all the variations of a shade, our brains neatly fold them into larger color categories. Teal, navy, colbalt and aquamarine would be blue. While crimson, scarlet, and carmine would be categorized as red. The same applies for other shades as well. 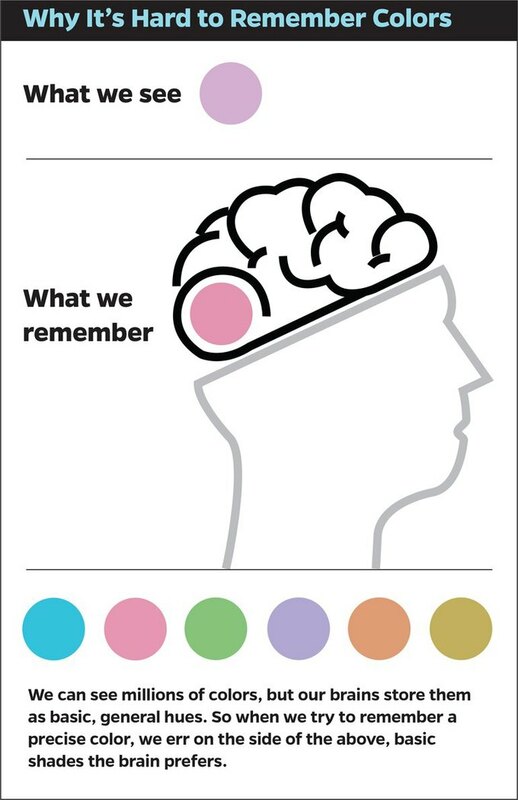 This might seem at first an inability on our parts to memorize colors is actually our brains natural tendency to compartmentalize and categorize. Royce Faddis/Johns Hopkins via Futurity. According to Flombaum "It’s not that the brain 'doesn’t have enough space' to remember the millions of options, he says, but rather that the mind tries to reconcile those precise details with more limited, language-driven categories. So an object that’s teal might be remembered as more ‘blue' or more ‘green,' while a coral object might be remembered as more ‘pink' or more ‘orange.’"
Not only is this completely fascinating, but these findings might have larger implications for our ability to understand visual memory.